All components made in North America. 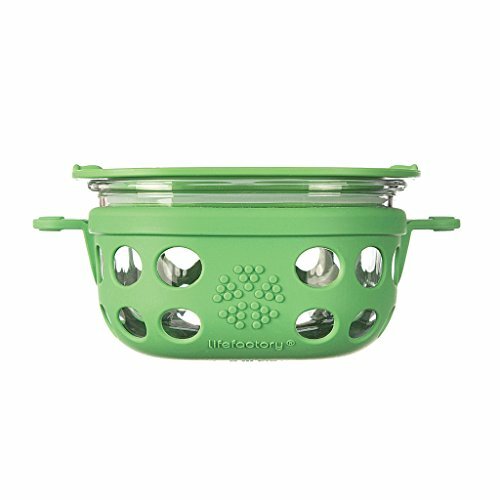 Product assembled in the U.S.
Lifefactory glass food storage containers provide a medical grade silicone sleeve for added protection and a lid made of polypropylene (pp#5) which is free of BPA and BPS. Lifefactory uses tempered glass, which makes the containers freezer, oven, mircowave and dishwasher safe. microwave, freezer and dishwasher safe. It is not recomended to mircowave or bake the lids. (pp#5) lids made in the U.S. The 1 cup (240ml) is ideal for smaller, kid-friendly portions of healthy snacks and veggies. Our mobile food storage collection delivers functional utility matched with delightful vibrancy. Perfect for taking a healthy lunch to work or storing family leftovers. Bring glass storage to the park for a picnic and beautifully deliver dishes straight to the table at dinner parties. We offer a range of colors that can be mixed or matched to add a dash of design to your cabinets and fridge. 1 cup (240 ml).